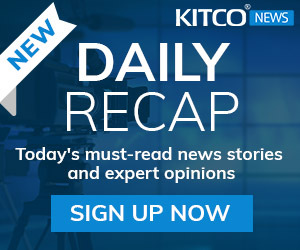 I see uranium as a better speculation than gold today, and I'll tell you why. But first, let me ask you something. Does it make you angry for me to say so? If so, you're in danger. The art of successful speculation is about rational evaluation of trends and probabilities. We can't afford to let what we wish were so to interfere with our ability to see what is so. 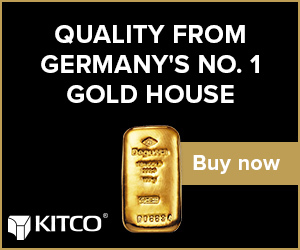 I should also quickly say that I don't see gold as an investment at all. Gold is money. It's the ultimate refuge for wealth. It's where I put my savings. 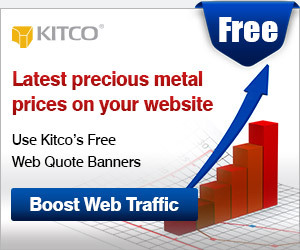 Gold stocks, however, are assets I speculate on when I think gold prices will rise—which I do. 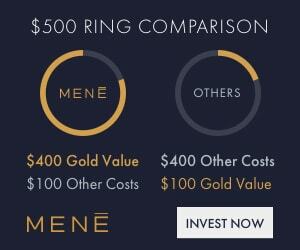 I currently have more money invested in gold stocks than anything else. But my most recent speculations have all been in uranium stocks. That's worth stressing, because I'm not just giving you a theory here. 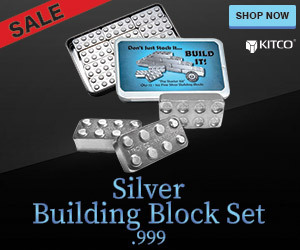 I'm telling you what I'm doing with my own hard-earned cash. So why do I see uranium as “better” than gold today? Because I don't know what will happen to gold in 2019. Neither does anyone else, no matter how confident they sound. Gold could easily break out and make many gold bug dreams come true next year. But it's been range-bound for years, and that could continue next year as well. We'll only know for sure in hindsight, which is not helpful today. On the other hand, uranium has long been a “when, not if” question, and I do think uranium's time has come. Note that I don't say that uranium's time is imminent. 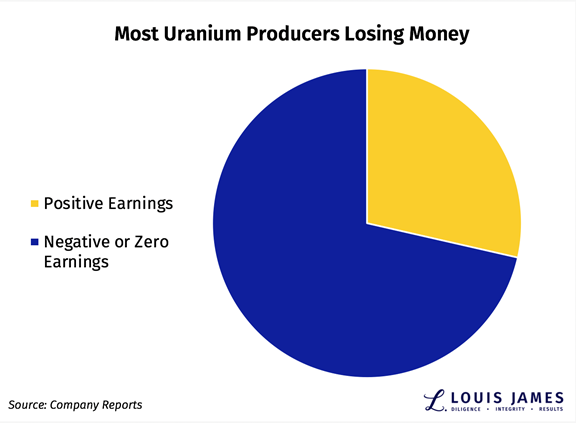 I understand that investors have been burned by uranium's false dawns in recent years. That's why I've been waiting for a set of conditions that tells me the rally is for real. That's exactly what I see today. First, there's uranium's price action. In the first decade of this millennium, the world woke up to the fact that it needs nuclear power. The entire conversation shifted as people of different political bents around the globe realized that nukes don't dump carbon into the atmosphere and can be built anywhere. Even China, one of the world's worst polluters for decades, understood that it has a serious problem and it needs to stop burning so much coal. 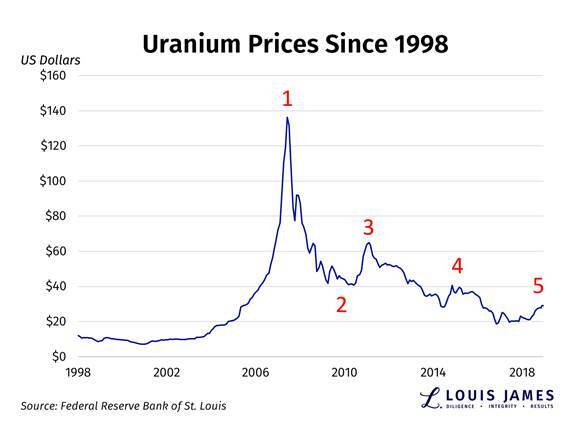 It was a great, true story, and uranium prices went vertical in 2007. But it was too much too fast. Uranium prices corrected dramatically. That was no surprise and a reasonable market response. Prices fell to near the average cost of production. The pro-uranium narrative took hold again. China announced plans to build scores of nuclear power plants. Other countries followed suit. Prices started soaring again. Then the Fukushima nuclear disaster struck, abruptly halting uranium's rise. Prices have been sliding pretty much ever since. Prices were down, but the narrative remained strong. Germany decided to move away from nuclear power, but more reactors were being built world-wide than shut down. Even the Japanese were facing the fact that they have to have nuclear power and will need it for decades to come. Prices rallied again, but then started falling as cash-strapped Japanese utilities sold excess uranium stocks they weren't going to need for years, if ever. This relentless selling pushed spot uranium prices well below the cost of mining the stuff. The narrative has not changed. The world still needs nukes. China, India, and other countries are building scores of them. Even the US is looking to build its first new nukes in decades. But uranium prices continued scraping along the bottom, under relentless pressure from secondary supply from Japan hitting the market at fire-sale prices. This brings us to now—a terrible time to be a producer. Uranium cannot be substituted in less than decades. Uranium cannot be mined profitably at current prices. The world's uranium producers are in dire shape. Even the best of them, Cameco and Kazatomprom, are shutting down production in response to lower prices. That includes flagship mines like Cameco's high-grade McArthur River mine. Uranium is selling so cheap, miners with long-term contracts for delivery at higher prices are buying uranium at spot and selling that to their customers instead of mining. 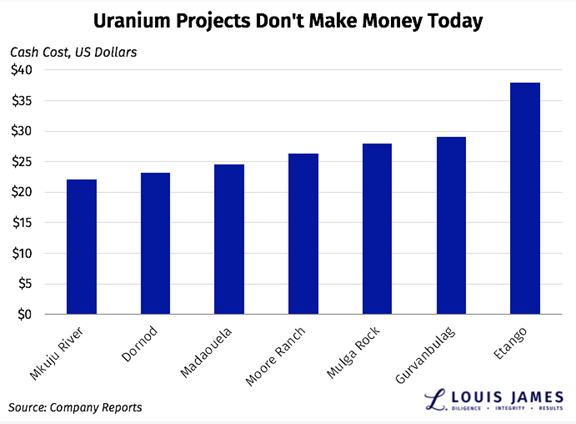 As crazy as it sounds for uranium producers to be buyers, it makes more sense than spending more money mining and depleting their assets in the ground. This cannot and will not last. Even the companies with the best new projects are in no hurry to advance them toward production. Note that the cost per pound of production in the chart above is a cash cost figure, not an all-in cost. You can add 50–100% to the bars above and still get a conservative estimate for how high uranium prices would have to rise for these projects to be profitable. Meanwhile, the two facts remain: the world needs uranium; and it's not going to get it at current prices. Something needs to give. But why do I think dawn is finally here? In part, it's the most recent price action. Let's zoom in on the last couple years. As you can see, the current high is higher than the two false dawns we've seen since the bottom in early 2016. Perhaps more significantly, we've seen higher lows since then as well. The last few pullbacks have been nickels and dimes. This trend is very strong. A critical point here is that the Japanese have announced plans to restart nine nuclear power plants now, and 21 more over time. Another very important point for resource speculators is that uranium's fundamentals are almost completely insulated from the general drivers of the commodities markets. Specifically, this means that while there's significant potential for near-term weakness in other metals and resources, uranium has already dropped below “stupid cheap” and has more imminent upside than downside. All of uranium's indicators are pointing upward. It's the only asset of any kind that I can think of for which this is true. I think the bottom is in. I think the steady rise since last April means that the Japanese have either slowed or stopped selling secondary supplies. If I'm right, uranium prices should be on the verge of an explosive and sustained breakout to the upside. If that happens, the increases will be multiplied by the best uranium stocks. 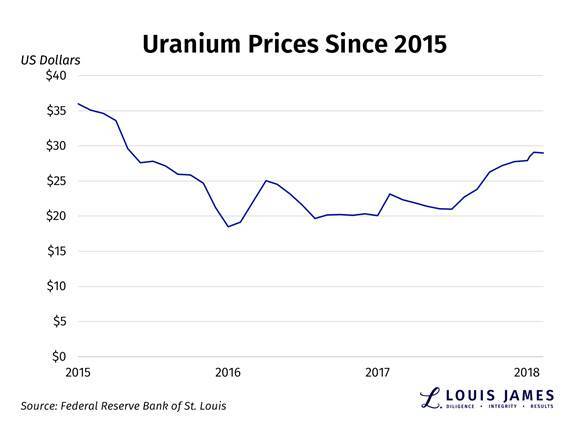 I am not promising that uranium prices can't or won't drop again. I am saying that I think this is the time for savvy speculators to start building positions in great uranium stocks.